The Vijay starrer Mersal is gearing up for a worldwide release on October 18 on a big scale. Being a Diwali release, there are strong expectations of this film getting a big opening. While it is well known that Vijay’s popularity in Kerala and Andhra – Telangana region is ever increasing, the buzz now is that there are strong expectations for his Mersal in Karnataka as well. When fans were getting ready to celebrate the release of the film, another issue has cropped up now. 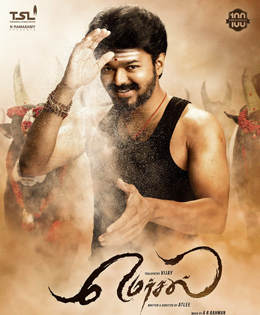 Central Board of Film Certification demands Mersal team to submit NOC (Non Objection Certificate) from AWBI(Animal Welfare Board of India) for scenes featuring animals in the film. Earlier, Mersal team said that they have got U certificate but in an official mail to AWBI, CBFC denied clearing the film after the former asked for a clarification. In a letter to Animal Welfare Board of India, M M Mathialagen, regional officer of Censor Board, has said that the film is yet to be certified, as a NOC (no objection certificate) is pending from AWBI. "I strongly deny the allegation that the film 'Mersal' had been issued certifiate. Till this moment, CBFC, Chennai, had not issued certificate to the film. As informed in the application, the applicant has not submitted NOC from AWBI and hence he was directed to submit the same," he said. The officer added: "The applicant stated that he has submitted his application for NOC to AWBI and will submit the same on receipt of it." Mathialagen said he examined the film on October 6 and also recorded on file that certificate shall be issued on receipt of NOC. "The show cause notice was issued to the applicant on 11.10.2017 and the applicant has submitted the cuts on 12.10.2017. The cuts have not been verified as NOC from AWBI has not been received," he added. Directed by Atlee, the film also has an ensemble of actors including Samantha, Kajal Aggarwal, Nithya Menon, SJ Suryah, Sathyaraj, Vadivelu, Sathyan, Yogi Babu and Kovai Sarala.